Verizon Digital Media Services has deployed Quick UDP Internet Connections (QUIC) across its content delivery network, with 125 points of presence globally. QUIC is a transport protocol developed by Google to improve web page load and transaction speeds. Specifically, QUIC improves web application performance across Chrome and Opera web browsers and select connected devices by decreasing the time required to establish a secure connection. It also continues to deliver an active stream, seamlessly and uninterrupted, when an end user changes IP addresses by continuing to use the old connection ID from the new IP address. Verizon Digital Media Services said its customers can now enable QUIC through a simple rules engine change that takes effect within minutes, at no additional cost. Limelight Networks and Akamai Technologies have signed a binding Memorandum of Understanding that settles all outstanding legal disputes between the parties. The parties also agreed to license certain patents to one another as part of the settlement. Financial terms were not disclosed. Both companies specialize in digital content delivery. Cisco and Reliance Jio are collaborating in multi-access edge computing. The companies are developing a use case to optimize and enhance video experience over the network by building a mobile content delivery network (CDN). In this concept, the CDN is integrated into the mobile LTE network with edge caches in close proximity to the mobile users. The idea with a mobile CDN is for the mobile operator to deliver content via edge cloudlets to provide a better user experience with lower latency and higher performance. Cisco said its mobile CDN work with Reliance Jio uses a combination of IP address management techniques based on the mobile core, requiring tight integration between edge cache, mid-tier cache, and the traffic router in the Cisco Open Media Distribution system. The mobile core and the Cisco Open Media Distribution are combined into one system level solution for the CDN embedded in the mobile network. To solve the problem of user plane selection, the system uses Control/User Plane Separation (CUPS) as defined in 3GPP R14. 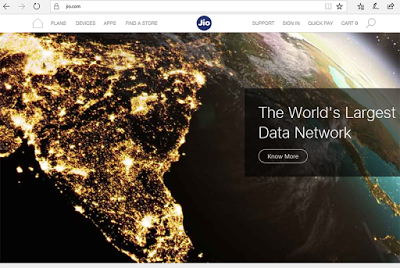 Cisco and Reliance Jio also solved the issue of assigning a geographically appropriate IP address to the mobile device and the issue of handover resiliency in the face of IP address changes on the client side and the CDN cache site without change or disturbance to the current services. Exceda based in Sao Paolo, announced that XCDN, a major eCommerce-based CDN, that is currently available only to customers in the Americas region, is to be expanded via collaborations with multiple CDN partners to enable the delivery of website content to and from locations worldwide. Exceda XCDN works by caching customer website content in hundreds of thousands of servers located in networks and data centres worldwide. This allows content to be served from the location nearest to the end user, based on both the distance and network conditions, to reduce latency. The service is designed to protect users from site outages and slowdowns due to heavy visitor traffic, Internet outages and malicious traffic, as well as help reduce expenditure on physical or cloud web infrastructure. XCDN, which is delivered via a partnership with Akamai, is currently available to customers across the Americas region and is due to be available for sales outside of the Americas from July 2017. Describing the service, Exceda's CTO, Terry Drozdowski, said, "Simplicity is at the heart of XCDN, customers pay a flat rate for traffic delivered anywhere in the world… I believe that XCDN will be extremely attractive to small businesses throughout Europe, Asia, and Africa who will be able deliver their sites via XCDN starting in July". Ciena announced that Globecomm, based in Hauppauge, New York, a global connectivity solutions provider, has deployed its converged packet-optical and packet networking solutions to address increasing content distribution requirements for applications including video for the news industry, disaster recovery for armed forces and connectivity for ships worldwide. The upgraded network is designed to enable Globecomm to cost-effectively increase the capacity and improve the reliability and availability of high-bandwidth services to its more than 250 customers globally. Globecomm is a global connectivity provider operating in more than 100 countries, providing satellite-centric video, voice and managed data solutions for media sector, maritime, wireless, enterprise and government customers. Ciena noted that due to the need to support mission-critical, time-sensitive applications for its customers, Globecomm's network needs to be both responsive and reliable. Ciena's Ethernet switching, optical transport and network management solutions are designed to provide Globecomm with the fast, reliable and high-performance connectivity required to meet the demands of customers that may be operating in harsh and/or remote environments. Under its growth strategy, Globecomm is expanding its terrestrial network capacity and reach utilising Ciena's solutions as the backbone. 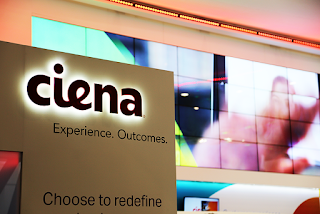 Ciena noted that as part of this initiative the provider recently deployed a high throughput content distribution network (CDN) to support its growing media customer base, while expanding into multiple developing countries in Africa and Asia. For the project, Globecomm has deployed Ciena's 10 Gigabit Ethernet 5142 Service Aggregation Switch to enable the cost-effective transmission of quality, bandwidth-demanding content such as videoconferencing, surveillance and video streaming over Layer 2 and 3 networks. In addition, the Ciena 6500 Packet-Optical Platform allows Globecomm to customise service delivery and deliver applications at rates from 2.5 to 200 Gbit/s and beyond. Additionally, utilising Ciena's network management capabilities Globecomm is able to design, schedule and commission services across its network within minutes. Telstra is piloting a service that pre-downloads premium movies onto consumer devices before they request the content. Participants will receive notifications when the latest movies that match their interests become available. Telstra is working with Ericsson and The Fox Innovation Lab at 21st Century Fox on this unique content delivery solution. It leverages Ericsson MediaFirst's cloud based media store for content processing and origin; Ericsson's Unified Delivery Network for global content delivery; and Ericsson MediaFirst TV Platform, to provide a seamless, personalized, and intuitive experience. 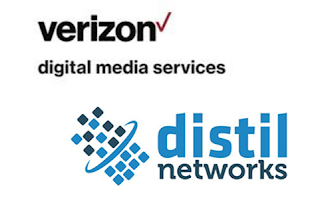 Verizon Digital Media Services is partnering with Distil Networks to deliver bot protection on the Verizon Edgecast Content Delivery Network (CDN). The partnership will enhance Verizon Digital Media Services' suite of security features, now incorporating protection against a wide-range of automated threats including: web scraping, application denial of service, account takeover, transaction fraud and digital ad fraud. The service is available immediately to Verizon Digital Media Services customers. "Malicious bots are more sophisticated than ever and quickly becoming the biggest threat to web applications," said Rami Essaid, CEO of Distil Networks. "By partnering with Distil, Verizon Digital Media Services has added to its layered defense approach to website security, now offering customers protection against a myriad of malicious bot attacks. We are honored to have been selected as a partner by one of the largest IT infrastructure and security providers in the world." Comcast Technology Solutions, which is a division of Comcast Cable, has expanded its direct-to-consumer (D2C) solution to help content providers build, launch, and manage over-the-top (OTT) experiences. The expanded D2C solution offers video processing, management, multi-CDN distribution, and playout capabilities, as well as a powerful out-of-the box suite of monetization options spanning subscription management, promotion, storefront enablement, and billing. The solution is built with an innovative UX integration layer that allows UX providers to easily develop pre-integrated multi-platform application templates for maximum speed and flexibility. 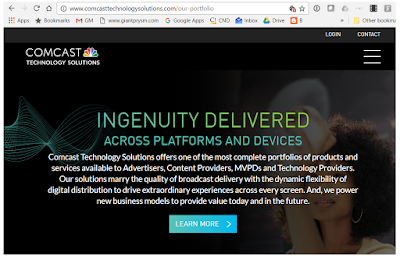 Comcast Technology said its turnkey solution supports a variety of monetization models, with maximum flexibility and simplified pricing for enterprise customers. "Content providers are increasingly interested in establishing direct-to-consumer businesses, but quickly become overwhelmed by the challenges of building, deploying, and managing OTT solutions seamlessly across any screen," said Barry Tishgart, Vice President of Comcast Technology Solutions. "Customers want simplicity, repeatability, and speed, but they don't want to be locked into a one-size-fits all approach that can't evolve with their audiences and business needs. Our turnkey solution enables content providers to reduce complexity, accelerate time to market, and optimize their workflows, user experience, and monetization models as needed." 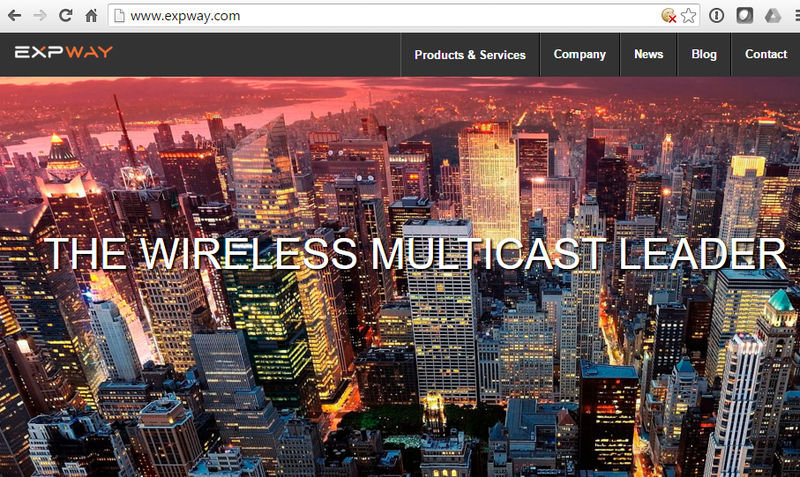 NTT DOCOMO Ventures has made a strategic investment of EUR 1.5 million in Expway for its wireless multicast solutions. Expway’s current investors, Innovation Capital, I-Source, TechFund and Isatis Capital also invested EUR 1.5 million in this round. 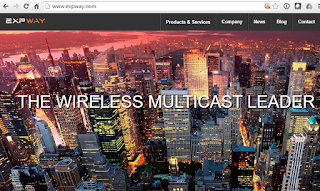 Expway’s newly announced Ultimate Mobile CDN solution optimizes data traffic between the telecom cells and the terminals using LTE Broadcast. In addition, Expway’s solution will also be made available on Wi-Fi networks to enhance video delivery in highly dense areas. 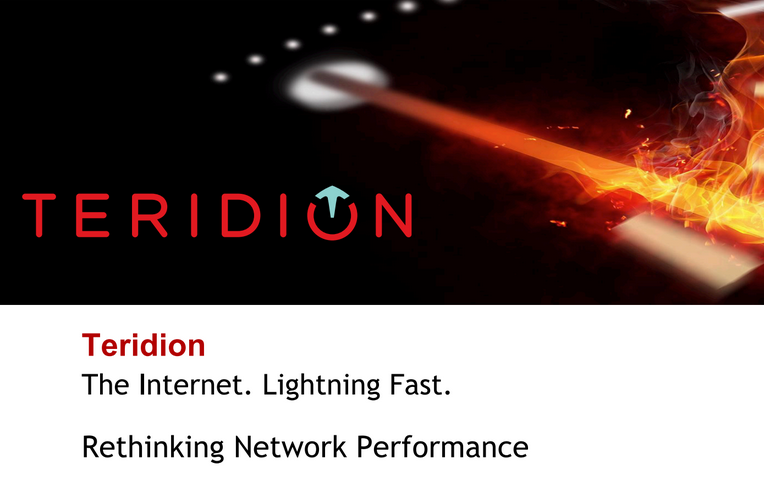 Teridion, a start-up based in San Francisco,announced the launch of its Global Cloud Network, boasting up to 20x performance improvement for end-user generated bi-directional Internet content. The Teridion Global Cloud Network - Bringing intelligent routing to the cloud. Proprietary algorithms and the Teridion Management System, in conjunction with Teridion Measurement Agents, provide a real-time congestion map of the Internet to find the best possible path, taking into account bandwidth, latency and geography. High performance, low latency - Up to 20x Internet performance improvements, enabling users to rethink what's possible online. Flexibility - Teridion Cloud Routers are created on demand, providing scalability and enabling users to only pay for the resources consumed. The solution works with the largest cloud providers in the world to ensure the speed and reliability of traffic, without requiring customers to leave their cloud provider. Bolstered security - Teridion does not cache users' data, and end-to-end SSL encryption with no termination secures data across the network. Simple onboarding - With no hardware or software to install, and quick and easy provisioning, a typical cloud customer can be connected to the network in under an hour. The company said its solution is currently being used by more than 15 companies spanning some of the most bandwidth-demanding applications and services, such as hosting and file sharing, rich media and advertising. Teridion also announced a total of $20 million in funding, having closed a $15 million Series B round of financing led by Singtel Innov8. Existing investors JVP and Magma also participated in the round. "The Internet is an incredibly powerful tool, but until now, we have struggled to take full advantage of its capabilities. It's still common for us to fall victim to slow response times and volatile connections," said Elad Rave, founder and CEO of Teridion. "We are breaking down these boundaries and providing users with a seamless Internet experience -- no matter their location, device or application. It's our goal for our SaaS customers to be able to generate additional customer loyalty, and the funding and general availability of our product are major steps in this direction." 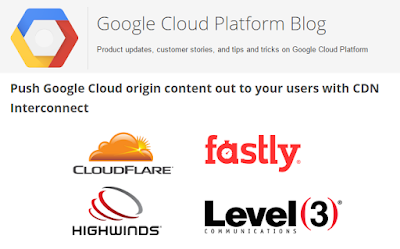 Google announced collaborations with four of the industry’s leading content delivery network (CDN) providers: CloudFlare, Fastly, Highwinds, and Level 3 Communications. The new CDN Interconnect program enables the customers of these CDN providers and the Google Cloud Platform to pay reduced prices for in-region Cloud Platform egress traffic (to approved CDN locations). Google said this CDN Interconnect program will encourage the best practice of regularly distributing content originating from Cloud Platform out to the edge close to end-users. Google provides a private, high-performance link between Cloud Platform and the CDN providers, allowing content to travel a low-latency, reliable route from the Google data centers out to the end users. Google is recommending that publishers on the Google Cloud Platform to also use a CDN provider especially for heavy, frequently accessed content. Google's network footprint currently extends to 70 PoPs in 33 countries. Level 3 Content Delivery Network is in 90+ major metro cities globally. CloudFlare posted the following explanation: 30 CloudFlare points of presence (PoPs) are directly connected to Google Cloud Platform’s infrastructure. When one of these CloudFlare PoPs requests content from a Google Cloud Platform origin, it’s routed through a high-performance interconnect instead of the public Internet. This dramatically reduces latency for origin requests, and it also enables discounted Google Cloud Platform egress pricing in the US, Europe and Asia regions. As of May 1st, Fastly has nine points of presence (POPs) interconnected with Google: San Jose, Los Angeles, Dallas-Fort Worth, Chicago, New York, Ashburn, Frankfurt, London, and Tokyo. Akamai Technologies has formed a strategic partnership agreement with China Unicom' cloud division – CU Cloud, one of the largest cloud computing service providers in China. As part of the strategic partnership, CU Cloud has agreed to complement its own cloud services for global businesses with Akamai's full suite of industry-leading media delivery, web performance, and cloud security offerings. Specifically, CU Cloud plans to leverage Akamai for CDN technology that will be available for the delivery of its Cloud services. Akamai enables operators to deploy a highly scalable, completely turnkey CDN that leverages the same technologies found within the Akamai Intelligent Platform. To be sure, streaming video really is the future. The online video phenomenon is creating a market and technology transformation that rivals some of the greatest technology disruptions in history. Just like the disruption of broadcast radio and cable television in their day, streaming video is transforming both consumer behaviour and business models. While the early days of online video were novel, limited to watching clever three minute YouTube videos, it was the advent of long form HD video from sources like Netflix, Amazon and Hulu that ushered in a new generation of viewers. For many of us with a Netflix account, the notion that you once had to wait for a TV show to come on air in order to view the broadcast already seems laughable. But, the implications for consumers worldwide and the network operators who serve them are profound. We have reached a point where the 40 year old and highly asymmetrical model of broadcast television is being turned upside down. Consumers are now fully in charge – they choose the content, device, time and place. As such, many cable operators are beginning to recognize and, in some cases, admit publicly, that as time goes on, their broadband internet service offering, not their cable TV service, will be their strategic product line. Furthermore, this transformation ripples out in many directions. High quality video streaming is not only making its way into our living rooms, via the popular uptake of connected smart TVs, but increasingly onto our mobile devices too. Today’s viewers expect to be able to watch their favorite TV show or film, anytime, anywhere and on any device, such as a smartphone or tablet. With research showing that more than half of a mobile viewers’ time is spent watching videos that are longer than 30 minutes, and live streaming of sporting events looming as the next tidal wave to hit mobile networks, it is clear that streaming really is the future. Therefore, it is critical that operators prepare their networks for the future of online video, or else customer satisfaction and retention will be at stake. 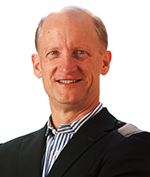 This transformation has even more profound implications for mobile networks for two reasons. First, 4G and 5G access speeds now rival fixed broadband performance in many regions. And second, the vast majority of consumers in the coming years will rely on mobile broadband services as their sole access to the Internet. According to Cicso’s 2015 VNI report, by 2019, 4.6 billion smartphones users will drive 97 percent of all mobile data and 72 percent of this mobile traffic will be streamed video. So, the implication for mobile network architects is that consumer will increasingly expect a “broadcast TV” experience while streaming video to a mobile device. Driven predominantly by the mainstream adoption of over-the-top (OTT) services from popular video-on-demand services like Netflix, Hulu, Amazon and from live-streaming sources like ESPN, NBC and Twitch, this exponential growth in demand for content will push existing mobile networks to their limits. Today’s mobile network operators face two unique challenges: first, they must optimize streaming video traffic so as to make efficient use of expensive RAN resources and, secondly, they must ensure Quality of Experience (QoE) for viewers who expect a high-quality, mobile viewing experience that rivals that of ‘broadcast TV’. The new mobile video optimization architecture must simultaneously resolve these two critical challenges – traditionally at odds with each other. 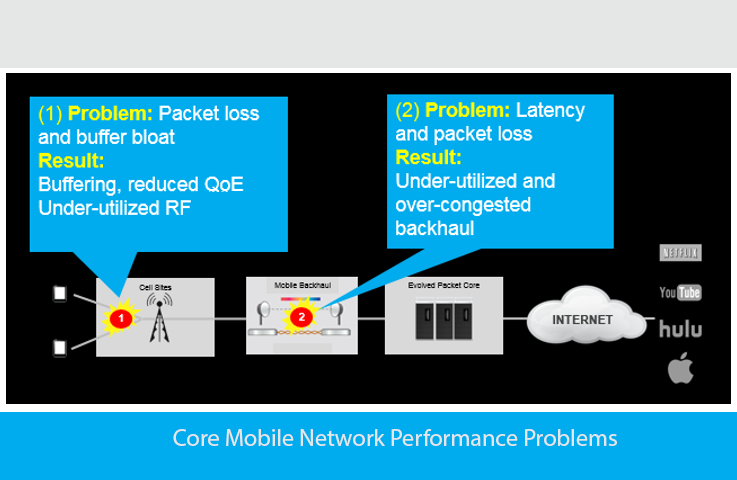 The technical performance problem faced by mobile networks given their current architecture is twofold: first, packet loss and buffer bloat across the RAN results in under-utilized Radio resources and second, latency and packet loss across the backhaul network and through the packet core result in underutilized and congested backhaul networks. The increasing amount of streaming video traffic on mobile networks exacerbates both of these problems as the streams are delivered from origin servers upstream of the packet core. The aggregate latency across this network path, from core to RAN, is a key driver for the downstream problems of packet loss and buffer bloat, which greatly hamper RAN efficiency. These conditions call for a new mobile architecture to address the onslaught of streaming video. Conventional wisdom would guide an operator to address this problem with brute force – buying more routers, switches and links to increase capacity. This is no longer a scalable or cost-effective approach. Choosing an intelligent open architecture and open caching solution can dramatically reduce the volume of repetitive streams clogging up the network by identifying, storing and delivering the most popular, high-quality video content from inside the service provider network. 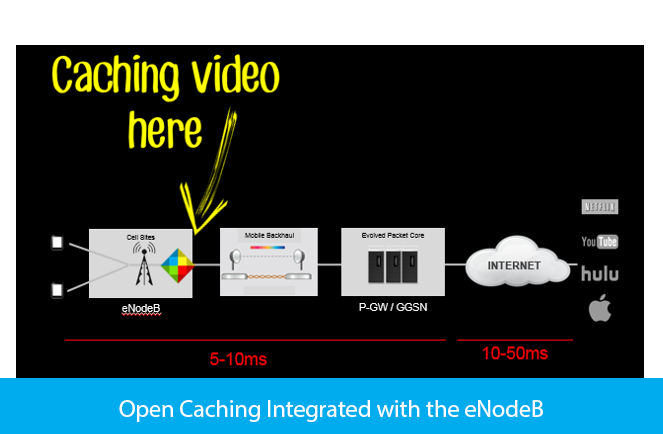 It’s interesting to note that an effective open architecture and open caching platform can reduce streaming video traffic demands by as much as 60 to 80 percent in some cases. At the heart of the new mobile network architecture is a simple principle: move content to the edge of the network, as close as possible to consumer. From a technical perspective, this new architecture calls for an open caching function, which is integrated with the eNodeB. There are already a number of disruptive forces at work in mobile architecture, including the notion of a Cloud RAN, which employs innovative front haul technology. This virtual RAN architecture can be deployed at a fraction of the cost of conventional systems. The integration of an open caching layer at each eNodeB can be accomplished through Network Function Virtualization (NFV) as the caching function can be enabled entirely through software running on commodity hardware. Furthermore, this NFV-based cache can use local compute and storage resources as needed to manage content at peak demand, when resources are strained. During after peak hours, the compute and storage resources can be assigned other tasks leveraging the NFV architecture. 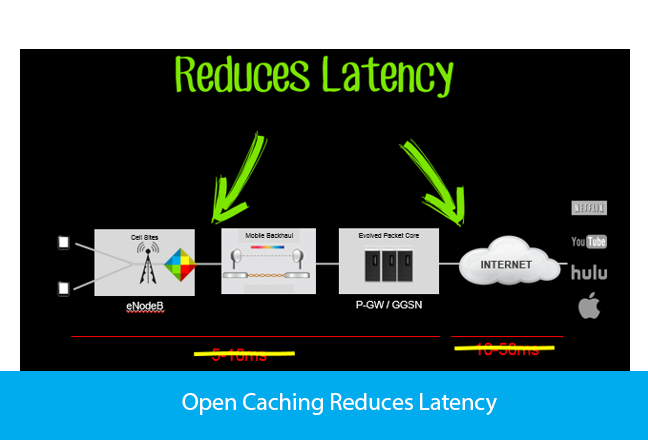 In combination, this new open caching architecture dramatically reduces network latency and, pivotally, improves viewer QoE. Resulting in substantial increase in RAN efficiency and dramatic improvement in capital utilization, hidden network capacity is unlocked. 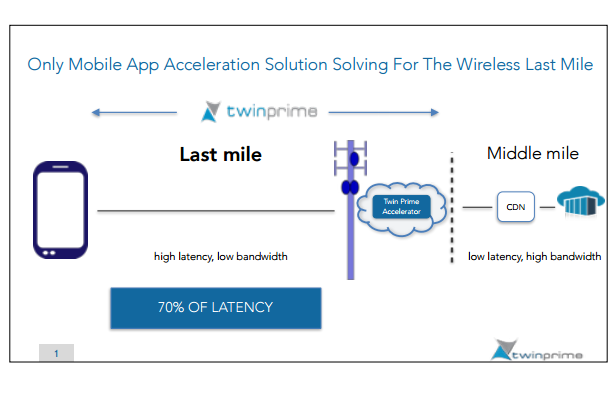 In addition, mobile operators can optimize their backhaul capacity spend, thereby tackling the next bottleneck in LTE networks. Ultimately, this new mobile architecture results in a substantial reduction in end to end latency. The impact on RAN utilization is significant as radio resources are able to manage streaming content with greater efficiency. Many technology providers expect this new architecture to improve RAN efficiency by 20 to 30 percent. So, at the end of the day, this new architecture will allow mobile operators to continue to leverage current radio network assets, unlocking capacity that would have otherwise been lost. As network operators and the technology companies that support them, we don’t have the luxury of pondering the outcome – consumers have spoken. They love the freedom and choice that comes with this new model of streaming video. It’s up to us now to create the infrastructure in mobile networks that will profitably support this new model of consumption. The Internet can certainly be relied on to deliver television, but only if network traffic is managed appropriately. Given that video is swiftly becoming a standard fixture in the consumer web experience, and deterioration in end-user Quality of Experience (QoE) can drive churn, operators must have the right network architecture as a starting point. It is this new architectural foundation that will allow mobile operators to deliver the future of streaming video to the consumers who want it so desperately. Mark Fisher leads strategic marketing and business development at Qwilt, bringing over 20 years of marketing, product management and business development experience in communication technology start-ups to the Qwilt team. Qwilt addresses the impact of OTT video on operator networks with a unified, turnkey solution that combines open caching, video delivery and analytics technologies deployed at the subscriber edge. Qwilt QB-Series Video Fabric Controllers optimise delivery of streaming video content to relieve network traffic congestion for operators and deliver a higher quality viewing experience for their customers. A growing number of the world’s leading cable, telecom and mobile service providers rely on Qwilt to optimize their networks to support growing consumer demand for online video content as a primary entertainment source. Founded in 2010 by industry veterans from Cisco and Juniper, Qwilt is backed by Accel Partners, Bessemer Venture Partners, Marker and Redpoint Ventures. Got an idea for a Blueprint column? We welcome your ideas on next gen network architecture. 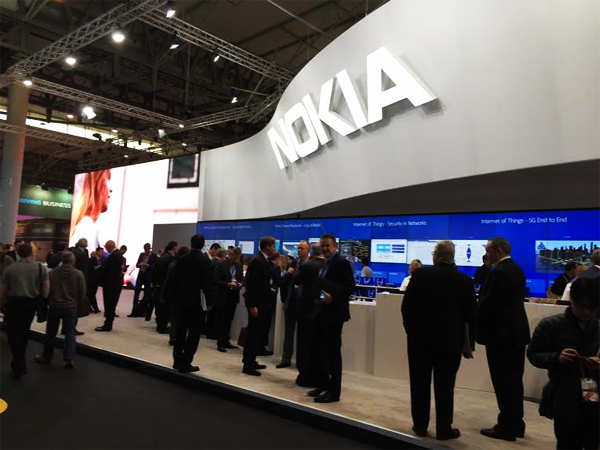 At this week’s Mobile World Congress, Nokia Networks is showcasing its Liquid Applications’ throughput guidance for heling content providers to optimize their transmission policy to reflect dynamically changing network resources in real-time. The goal is to improve resource utilization in mobile operator's network. YouTube has successfully conducted lab tests of the throughput guidance technology, with initial results showing improvement in network utilization and application quality of experience. Congestion detection from Nokia’s Liquid Applications notifies upstream content providers and mobile device clients as to the most efficient time to fetch subscriber content based on real-time cell load information. Nokia said Akamai is currently testing congestion detection as part of their Predictive Video over Cellular (PVoC) optimization solution for mobile networks. The company calculates that its smart location experience optimization service provides up to 50% increase in video streaming speeds for consumers based on insights on how applications utilize network resources. “We are now able to provide completely new insights into the dynamically changing performance of mobile networks, to improve content delivery efficiency and increase network performance. It is important for operators and content providers to keep up with the increasing demand for localized, data-intensive content that users want to receive with the fastest possible speed to their devices,” stated Dirk Lindemeier, Head of Liquid Applications at Nokia Networks. ETSI’s newly created Mobile-edge Computing (MEC) Industry Specification Group (ISG) kicked off its development work earlier this month with a first meeting hosted by Nokia Networks in Munich. The group is aiming to complete five documents by mid-2015: Terminology, Service Scenarios, Technical Requirements (including use cases and their benefits), a Proof of Concept Framework leading to a Framework and Reference Architecture. When the first documents get to the required maturity level, work on platform services, APIs and interfaces will commence. Mobile-edge Computing provides IT and cloud-computing capabilities within the Radio Access Network (RAN) in close proximity to mobile subscribers. Located at the base station or at the Radio Network Controller, it also provides access to real-time radio and network information such as subscriber location or cell load that can be exploited by applications and services to offer context-related services. For application developers and content providers, the RAN edge offers a service environment characterized by proximity, ultra-low latency, high-bandwidth, as well as real-time access to radio network information and location awareness. Mobile-edge Computing allows content, services and applications to be accelerated, maintaining a customer’s experience across different radio and network conditions. So far, the MEC ISG has attracted 24 member and participant organizations, including network operators, vendors, technology suppliers and content delivery network (CDN) providers. At the SDN & OpenFlow World Congress in Dusseldorf, Juniper Networks and Akamai Technologies are showing an Elastic Content Delivery Network (CDN) that could prove to be a more flexible solution for scaling video delivery. The proof-of-concept demonstration uses Akamai’s virtualized Aura Licensed CDN (LCDN) software and Juniper's Contrail Controller for SDN and network function virtualization (NFV) to dynamically scale up and down network resources to support content spikes resulting from the broadcast of large events. The technology is also designed to accelerate service creation for service providers utilizing CDNs to launch innovative multiscreen video services that help drive subscriber acquisition and loyalty. “Content delivery networks are evolving to meet the needs of increasingly real-time, distributed applications and users. Overlay networks have proven to simplify and automate the delivery of application and user-centric services without the administrative overhead of traditional infrastructure approaches. 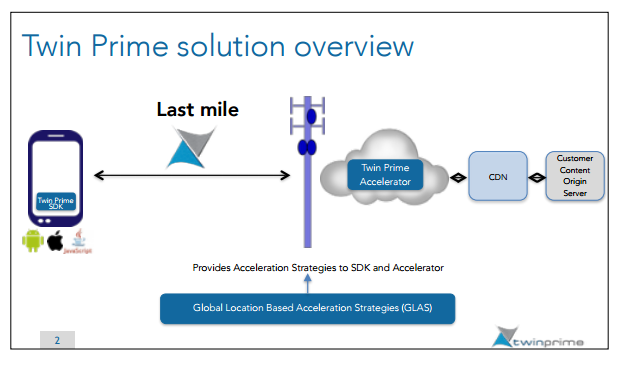 By combining Akamai’s virtualized caching components with Contrail’s scale-out network service automation, the companies have created a truly elastic CDN solution to meet the emerging needs of telco clouds,” stated Jennifer Lin, senior director product management, Juniper Networks. Alcatel-Lucent is rolling out a series of enhancements to its Velocix Content Delivery Network (CDN) solution to enable pay-TV operators to better manage their networks and set a new standard for the customer experience of IP video services. 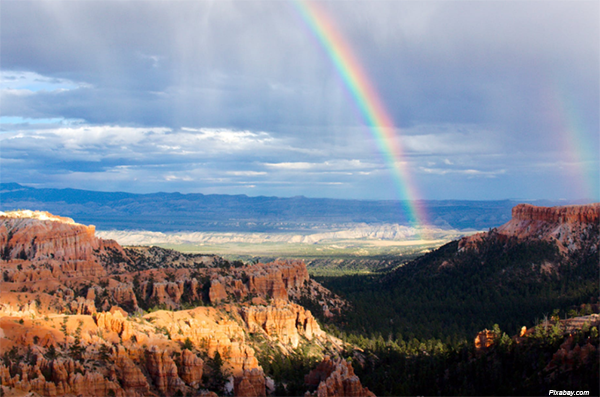 The new capabilities bring this CDN solution in line with Alcatel-Lucent's NFV portfolio. The company said its goal with these improvements is to decouple the software that controls and routes traffic on a network from the physical infrastructure that provides compute and storage resources. This greatly reduces the time needed to install or expand the CDN. Virtualization also gives operators the agility to instantly create a new CDN cache in case of a hardware failure, minimizing any potential disruption in quality of service. Specifically, the Velocix Virtual CDN will use automatic resource allocation to create an ‘elastic CDN’ capable of adjusting capacity to both planned and unexpected changes in demand, for example during a popular sporting event or due to a viral video. After the peak, computing resource can be released for other applications. The reporting capability of the Velocix CDN has been extended to give operators greater visibility of the traffic flowing through the network without increasing any additional latency or load. Patented Bell Labs techniques are used to measure the quality of video streamed to customers without the need for network probes or for installing software on customers’ devices. Integration with the network routing control plane enables the CDN to learn automatically from changes in the IP infrastructure and optimize the cache selection accordingly. For example, when a new IP address is assigned to a user, the CDN adapts dynamically to make sure customers are always served from the optimal cache. The Velocix Universal Network Application Programming Interface (UNAPI) also enables unprecedented integration with external systems to develop customized applications for network configuration, content management and reporting. Velocix Proxy Language provides a powerful way to dynamically control how content is cached and processed. Using an industry standard programming language (LUA), a pay TV provider can modify how a request is treated depending, for example, on a user’s location or device. This opens up a wealth of personalization opportunities to improve the customer experience or traffic management on the network. It also allows a service provider to bring the web traffic for their pay TV service onto the same CDN as the video traffic. Since its acquisition of EdgeCast Networks at the beginning of this year, Verizon Digital Media Services has added more than 20 new points of presence (POPs) to its global content delivery network. New POPs include Warsaw, Stockholm, Milan, Vienna, Melbourne, Helsinki, Kaohsiung, Batam, Jakarta and Sao Paulo. The company also expanded its presence with additional POPs in many cities already served, including London, Madrid, Paris and Amsterdam. These additions offer customers even greater connectivity and performance within these markets. Verizon said each new POP is built securely on the latest generation of delivery servers, with pre-built dedicated space for rapid expansion. The POPs have multiple diverse connections into last-mile networks and are provisioned to support the full suite of Verizon EdgeCast services. One example of the global CDN expansion occurred in a massive and diverse carrier-neutral Brazil colocation site in Sao Paulo. Serving as one of the most important Internet exchanges in the region, this Verizon-owned data center is in Sao Paulo’s high-tech corridor and has redundancy links across both the Pacific and Atlantic Oceans. In December 2013, Verizon agreed to acquire EdgeCast, a content delivery network company based in Santa Monica, California. Financial terms were not disclosed. The deal closed in January 2014. 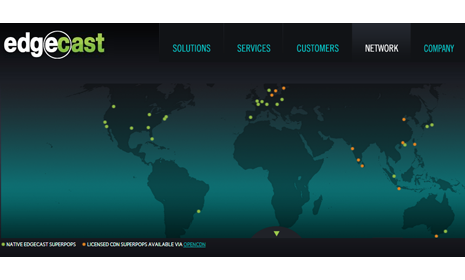 Edgecast operates a series of CDN "SuperPOPS" in over 30 locations around the world. Unlike earlier CDNs, which placed a small number of servers in thousands of locations, Edgecast focused on a smaller number of strategic global locations near primary Internet Exchange Points. These caching servers are located in data centers where major backbone providers operates Internet exchanges. EdgeCast claims more than 6,000 accounts, including some of the world’s leading Web brands for global media delivery and acceleration services. Verizon Digital Media Services plans to integrate EdgeCast capabilities in its own network.